Large space missions are planned in progressively more detailed stages. The European Space Agency selected the JUICE mission based on a concept study (the so-called ‘Yellow Book’). Last fall, the mission team completed the more detailed Definition Study (the so-called ‘Red Book’) that tells us much more about how the mission will study each of its target worlds. Almost everything we know about Europa comes from the 1990s Galileo spacecraft’s eleven flybys of this moon. While the JUICE spacecraft will perform just two flybys, it is likely to greatly deepen our understanding Europa and may even radically transform it. The Galileo spacecraft carried instruments that were based on 1970s technology. (Problems with the Space Shuttle program repeatedly delayed its launch, and it arrived at Jupiter in 1995.) The JUICE spacecraft will carry instruments based on today’s technology. Where Galileo and JUICE will have similar instruments, the JUICE instruments will be far more capable. JUICE’s imaging spectrometer, for example, will have approximately an order of magnitude more spectral sensitivity and up to four times better spatial resolution than its Galileo equivalent. JUICE will also carry a number of new instruments that had no equivalent on Galileo, such as an ice penetrating radar that will see structures beneath the surfaces of the three icy moons. JUICE also will return far more data than its predecessor. Galileo’s main antenna failed to deploy, leaving only the low gain antenna to return data. Compared to the data return that was planned, what we received from Galileo was like a getting a shot glass of water instead of a lake. JUICE’s main antenna will not require deployment, and minus a major mission failure, we’ll finally get that lake-full of data along with many measurements the Galileo’s instruments could not make. One unfortunate fact dominates all planning to study Europa. Jupiter is surrounded by a radiation belt that grows more intense closer to the giant planet. At Europa, the radiation is more than 20 times greater than at the more distant Ganymede. This allows the designers of the JUICE spacecraft to undertake comparatively modest radiation hardening to allow the craft to safely spend months in orbit around Ganymede, but to plan for just two quick dashes past Europa. With just two flybys, the JUICE mission will study in detail just a portion of Europa’s surface. The mission planners have chosen to focus those flybys on areas where Galileo images revealed recent geologic activity. These are terrains where the icy shell has been broken to create regions of chaotic terrain and/or have produced Europa’s characteristic ridges. These regions also have surface materials that suggest water has been brought to the surface from the underlying ocean. 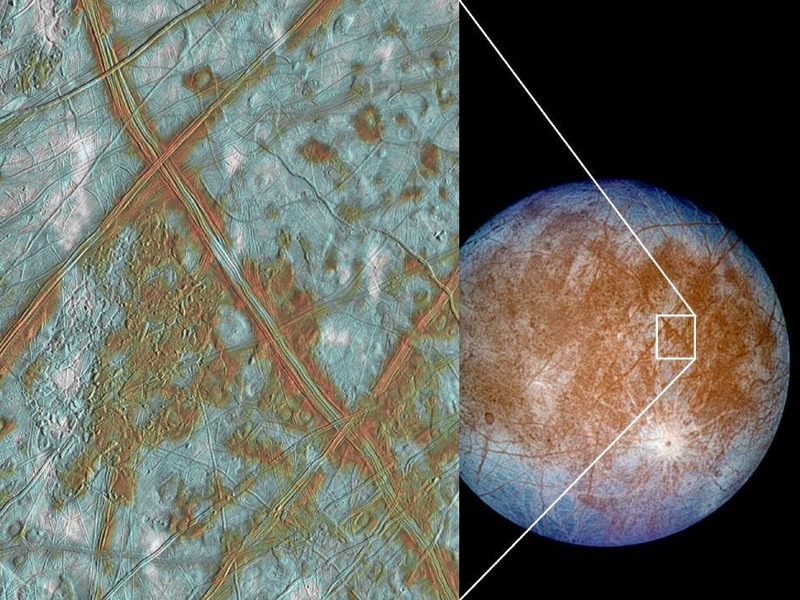 Examples of focus regions on Europa that the JUICE spacecraft may study. Red blocks are the regional focus regions, while the most detailed observations would occur directly below the path of the spacecraft (shown as the colored arcs). From ESA's JUICE Red Book. For the two encounters, the JUICE scientific team has identified three key goals. While the plan is to use almost all of JUICE’s instruments during the encounters, for each objective only one or a few of the instruments are expected to provide the prime measurements, while a few others will provide secondary measurements. Goal 1: Determine the composition of the non-ice material on the surface, with a focus on substances that relate to potential habitability of the subsurface ocean. 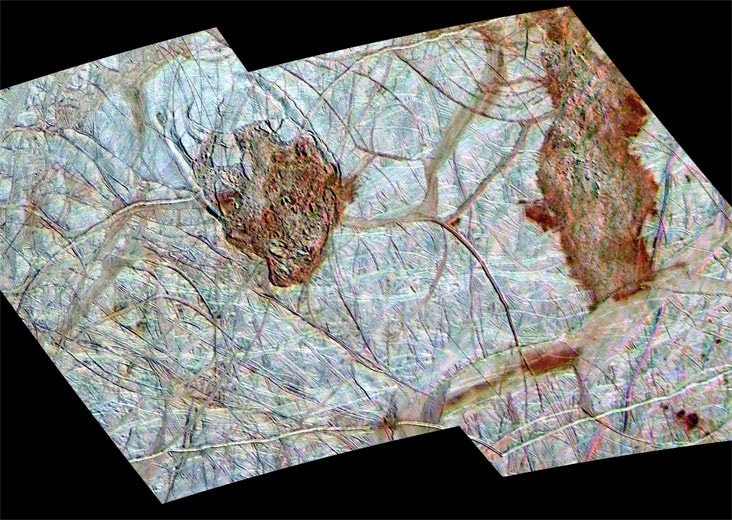 Galileo’s images revealed that in many places, Europa’s surface ice was reddish or brown. Scientists believe these are locations where fractures in the icy crust has brought materials from the ocean below to the surface. Once on the surface, radiation will modify these materials into sulphuric acid hydrates and hydrated salts. Further geologic activity may return these modified materials to the ocean below where they may be important ingredients to support any life. JUICE’s instruments will observe what materials are present on the surface, including those that could indicate biological origins, and gather data to help to explain the origins of these materials (whether they come directly from the subsurface ocean or have been modified on the surface). A suite of remote sensing instruments will study the spectra of these materials to determine their composition, with measurements ranging from the ultraviolet through the visible and into the infrared portions of the spectrum. The spacecraft will also use its in-situ particle instruments to directly measure the composition of surface particles expelled from the surface by radiation sputtering. For this goal, the visible-Infrared imaging spectrometer (MAJIS) will be the prime instrument, with the camera (JANUS), UV spectrometer (UVS), and the particle environment package (PEP), which includes a mass spectrometer, playing supporting roles. Goal 2: Search for liquid water below the surface. For this goal, the ice penetrating radar (RIME) is the star. The radar’s radio waves will be able to penetrate as deep as nine kilometers below the surface. From the returned radio signals, scientists will detect both the subsurface structure of the icy shell as well as detect bodies of water. They hope to detect either the top of the ocean itself (assuming that the icy shell is thin, at least below areas of recent geologic activity) or “lakes” trapped within between layers of ice. Europa has only a few craters on its surface, allowing scientists to estimate that geologic processes destroy and recreate the entire surface every 100 million years or so. Evidence for the processes that resurface this moons lies across its surface in massive lines of ridges, locations where the crust has been broken and rearranged like jigsaw puzzle pieces, and areas of lumpy terrain. During the flybys, the camera (JANUS) will take the starring role to image and map these terrains for analysis by geologists looking for clues as to how these processes operate. JUICE’s instruments also will be able to directly ‘taste’ material form the surface. The JUICE spacecraft’s suite of in-situ instruments (PEP) will sample the materials sputtered into space by this continuous radiation bombardment to allow scientists to better understand how this process remakes the surface material. 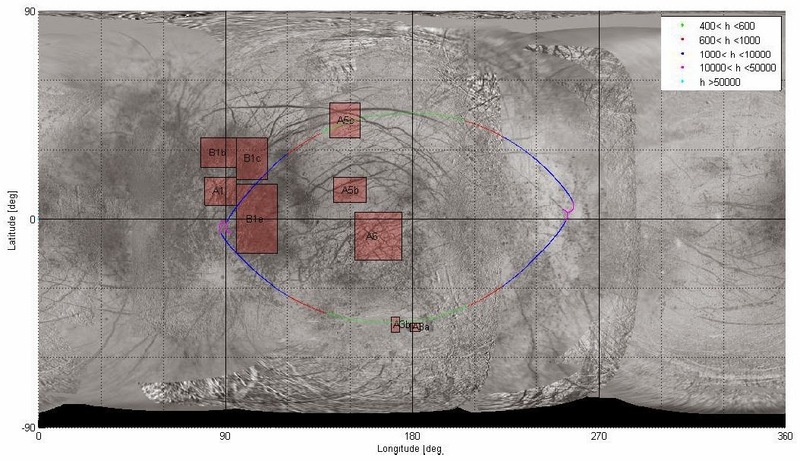 While the focus of the Europa encounters will be on the high resolution measurements possible only in the minutes around closest approach of each flyby, the spacecraft’s instruments will also make regional observations Europa’s surface to map its geology and composition in the hours before and after each encounter. In addition, JUICE’s camera and UV spectrometers will be used to examine Europa for months from afar to search for possible plumes of water. While there hasn’t been a confirmation of the reported plumes observed with the Hubble Telescope in 2013, any plumes present may only erupt irregularly or at low intensities. The JUICE spacecraft’s modern instruments and working high gain antenna means it will return far more data from Europa than the Galileo spacecraft could. Our understanding of this moon likely will become much richer than it is today. However, it’s also important to understand the limitations of the JUICE mission for studying Europa. Only two locales will receive high resolution imaging, and they will be within a single region of the moon. The JUICE mission’s scientists will select what they believe will be the two most interesting locations within that region with regional studies as the spacecraft approaches and departs. They will be relying on limited and mostly low resolution Galileo data to select their targets that will then be almost 25 years old. With just two encounters, the JUICE spacecraft may give us a biased understanding of this moon because the two sites may not be representative of the active regions found across this moon. The radiation hardening needed to do a full survey of Europa just isn’t possible within this mission’s budget (although I hope that the mission’s planners ultimately decide the spacecraft can tolerate an additional flyby or two). Instead, the JUICE spacecraft will go on to do a full study of Ganymede from orbit around that moon. If NASA’s Europa Clipper mission is funded and reaches Europa, it will conduct at least 45 flybys that will be distributed across the globe and will study a wider variety of terrain types. The larger number of encounters give a much better chance of sampling all the important terrain types. With this many flybys and the possibility of more during an extended mission, the Clipper can do repeat flybys of specific locations to follow up on important discoveries made during the mission. A large number of globally-distributed flybys also are required to enable certain studies such as the gravity studies of the interior or magnetic induction studies of the ocean to constrain its volume. The Clipper mission may also carry a high resolution camera to search for safe landing sites for a follow on lander mission. (This camera was included in the last documents I saw, but the mission and its budget have yet to be approved and a high resolution camera adds significant costs.) If the Clipper spacecraft carries this camera, then it has a much better chance of finding a safe and scientifically interesting landing site with forty-five encounters than the JUICE spacecraft will have with two. With luck, we will have both the JUICE and Clipper missions. 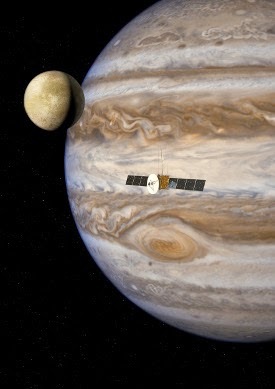 JUICE will study Ganymede in detail as Clipper will do with Europa. In that case, the JUICE encounters will add to the Clipper’s encounters and allow the measurements of the two missions to be calibrated. If Clipper doesn’t fly, then we will have two encounters for a regional study of Europa from a highly capable spacecraft and its instrument suite. Breaking news: I listened in on a presentation by Jim Green, head of NASA’s Planetary Science Division at this week’s Small Bodies Assessment Group. Dr. Green says that NASA hopes that it will be able to use the $100M Congress added to NASA’s budget for a Europa mission to enable a New Start for the Europa Clipper program. This is the term for when a mission goes from the wish list to an approved program. This is the first that I had heard that NASA’s management was looking to commit to a Europa mission. This isn’t a done deal: the President’s Office of Budget and Management (OMB) must also approve a new start, and in the past they have not been. (Congress must also approve a new start, but the substantial funding it has already supplied suggests that it would.) We will see with the release of the Fiscal Year 2016 budget request whether OMB’s stance has changed. IF a new start is given, then the important questions will be the total budget for the mission and when launch is planned (which might be in the mid-2020’s).